Rocky Mount is a city in eastern North Carolina, about 45 minutes east of Raleigh, and contains about 70,000 residents. 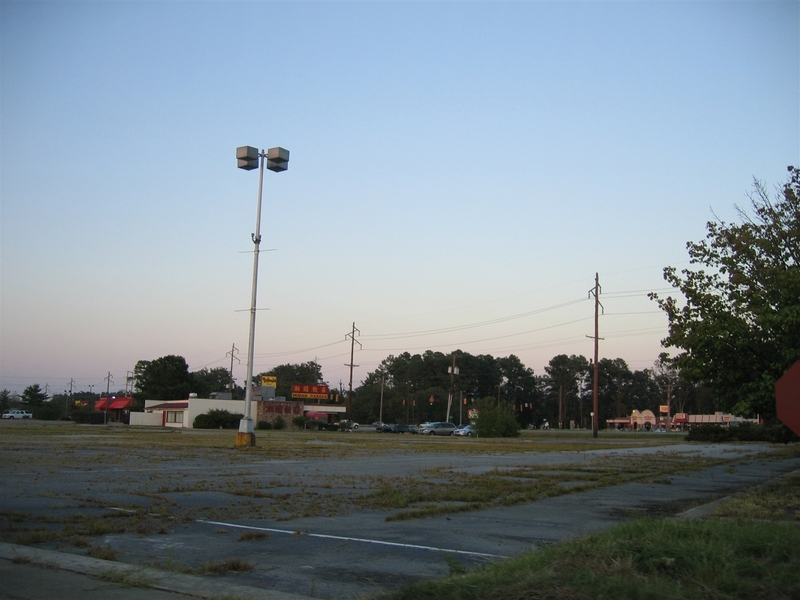 Rocky Mount is known for being home of the first restaurant which would become the Hardee’s chain. It is also strategically located on I-95. In September 1999 Hurricane Floyd swept through Rocky Mount and caused major flood damage throughout the area. One of the casualties of the hurricane was Tarrytown Mall, the second enclosed mall in the state. Here are some pictures of Rocky Mount underwater during the flood. Tarrytown Mall, which opened in 1962, sat under several feet of water for over a week. A relatively low spot in general, Tarrytown Mall was particularly susceptible to floodwater and as a result of the flooding completely destroyed the mall and sadly it never reopened. Here are a whole bunch more pictures of Tarrytown Mall as it sat abandoned. Tarrytown Mall sat for over 6 years before Sam’s Club came and decided to build a club there, and resurrect the site from abandonment due to the natural disaster. First, they needed to remove all the asbestos from the 40+ year site. Then, in April 2006 most of the mall structure was destroyed, and by 2008 a new Sam’s Club was open in its place. 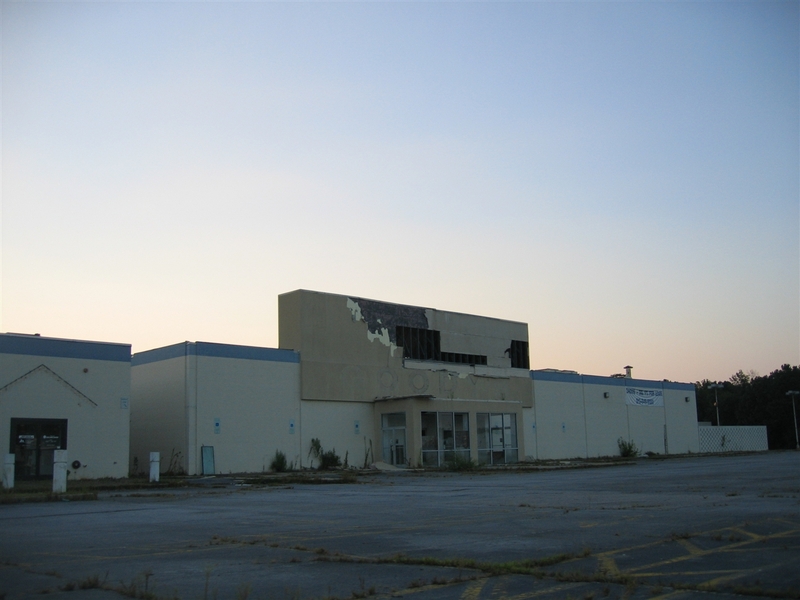 We visited Tarrytown Mall, or what was left of it, in August 2005, nearly 6 years into its tenure of abandonment. We know a Montgomery Ward store was at the site, but we know little else? If you can help us piece together the history of Tarrytown Mall, do so in the comments for this post. A few questions: What was Tarrytown Mall like immediately before the hurricane? Did it co-exist on the same level as Golden East Crossing, a competitor mall across town, or was it already on the way out? Let us know. When I visited this mall in 1995 it was dead. There were no major stores in the mall at all. One of the stores was a thrift shop with items marked with masking tape and sharpie markers. The inside was in disrepair, with a leaking roof and apparently no air conditioning! I’d say the hurricane was probably the best thing to hit this mall in a long time. Wow. At 1995, most malls dead/dying/demolished were humming along. RAM still Target. Grand Avenue Mall, Mall 205, NW Plaza, Mall o’ Memphis, they were still alive. Well, River Roads Mall and Cindy City and DSM were dead, but who cared? Cory, what other stores were in this sad dump? Usually I have a photographic memory, and can tell someone what they said, the precise moment they said it, what they were wearing when it happened, the tone of their voice, and their facial expression during the discourse. That is the type of detail I usually recall. But this mall was so, so non-impressive (rather DEpressive) that it wasn’t even noteworthy. The thing I do seem to remember were that one anchor had turned into a thrift store, and another store was coverted to ( I think) a LeeWards (craft store) or something of that nature. I remember rows and rows of plastic flowers at the entrance…not as fixtures, but they type of silk flowers that craft places sell. I also remember the wooden background to the facade….kind of a “parque” pattern, for lack of a better word, which is typical of the LeeWard’s in the 70’s. There was also an athletic shoe place, a Footlocker I believe, and there was a store selling asian home decor. In the center court, and I use the term loosely, there were locals setting up card tables to sell their arts and crafts…hand knit wire hangers and Kleenex cozies. The whole place was like one big “thrift fair”. It was HOT, as there was no air conditioning in the entire place. It was sticky and humid in the mall the day I visited, but it was dry as a bone outside. Weird! The mall that it reminded me of was Valley Fair in Appleton, WI (my home town)….VF claimed to be the first climate controlled shopping mall in the country. There were always debates as to whether that could be substantiated, and just recently VF was demolished much like Tarrytown. Oh, hey, since you brought up Grand Avenue, an inside source tells me that they are losing another store…one that has been with them since the mall’s inception. It shouldn’t be hard to figure out which one, since there are hardly and stores left. Well, at least the mall finally got rid of the labelscars from Gap, Kinney Shoes, Sterling Optical, and Body Shop. Ashensky still hasn’t released any new plans yet for that dying center. I have Colonial Grocery Store, Goody’s, JCPenney, Montgomery Ward, and Rose’s (former Woolco perhaps? one of those buildings looks Woolco-ish) as the anchors. There was also something called Wholesale Depot which left in 1994. Wholesale Depot was a membership warehouse, slightly smaller than a Sam’s Club or Costco. The one I remember was at the old Westgate Mall in Bangor, Maine; and it lasted from ~1990-95. Despite living 3 hours away, I was dragged there by my parents on a few occasions. Very interesting mall you profiled, Prange Way. It looks like this mall never got much exterior or interior renovations at all over its history, as evidenced by the very dated-looking Monkey Ward’s store, and save for the possible exception of Goody’s(as its labelscar looks consistent with their 1990s logo). @Allan M., There was also a K& W cafeteria which was really the biggest draw to the mall, an upscale children’s boutique called Bib N Tucker, and an upscale womens apparel boutique called Serotta’s. In addition there was a shoe show right outside Montgomery Ward and across from that was Kerr Drug. Outside of Goodys there was GNC and in the other corner outside of Goody’s there was KB Toys and next to KB Toys there was a grill serving hamburger and cheesesteaks, but I can’t remember the name of it. Now that I think of it too, it somehow(don’t ask me why) reminds me a little bit of Lauderhill Mall in Florida, which was previously profiled here. This mall was thriving until “Golden East Crossing” opened down the road. These were some of the stores that I recall: (1) K&W Cafeteria, (2) Ward’s, (3) Roses-(turned to Big Lots, then turned to “Goody’s”), (4) JC Penny (turned to Nichols dept store, which turned to a “Pharmhouse” (like a Pharmor), (5) Kerr Drug, (6) KB Toy Store. Once Golden East Mall open, the inside became “local flavor” stores and such. Only Wards and the K&W remained. Prior to a 1990s remodel, which redid everything in pink and green, the interior was 1960s for certain, with fountains everywhere. The ceilings were also very high, and the shortish windows lined the top of the walls, in 1960s style. Interesting to come here and read about the mall that was the place to go in my hometown…that it until 1986 when Golden East Crossing opened. After that, Tarrytown tried everything it could to stay alive. They added a few stores as referenced above, but nothing worked. Right before it closed, it still housed a very successful K&W Cafeteria and Goody’s. I’m pretty sure Montgomery Ward was already closed before the flood took place. There was also a Charter School on the other side, where JCPenney then Nichols then Warehouse Depot were located. So, all in all, it was a dying mall that lived on the leases of home grown stores selling crafts and other types of junk. Oh and you’re right, there were fountains everywhere until the renovation. I should know, I jumped into one once! Been in the Rocky Mount area all my life and at one time TarryTown was a nice Mall until Gloden East opened. There was a Record Bar ( moved out to become TRAXX ), Spooner Sporting Goods, KW Cafe, Dunderbach, K B toys, Coffemans Mens Wear, J Royal Mens wear, Shoe Shoe, JC Pennys, Wards. Roses, ( Big Lots ) It was really a nice place. Once Golden East opened the chain stores moved out and the craft stores moved in. It was a shame to see such a large building fall to the wayside as this one did. Floyd came through and washed what was left away. I was born and raised in Rocky Mount and remember a lot about Tarrytown. Tarrytown Mall opened in 1962 at the corner of Sunset Ave and Hwy 301 and was then known as the largest mall east of Raleigh at the time. 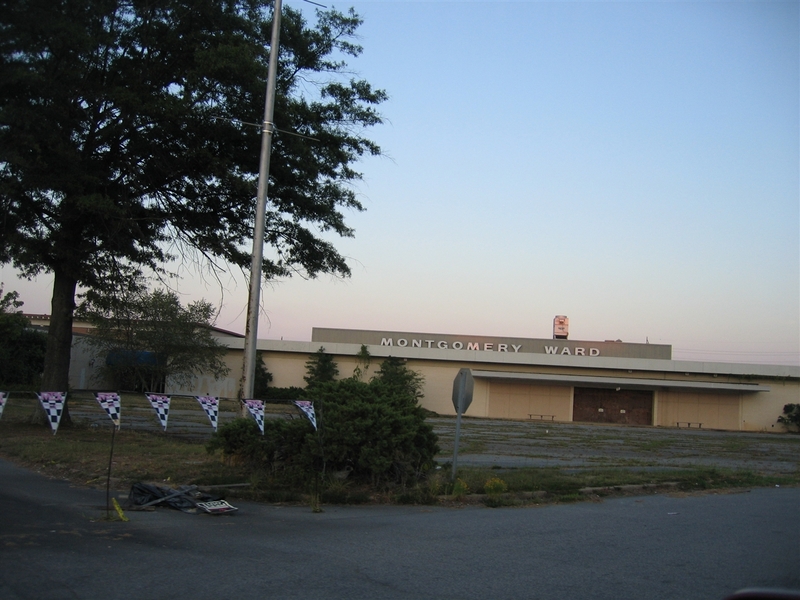 Tarrytown Mall was a retail hub in Rocky Mount for over 20 years. Montgomery Ward was an original anchor in the mall, but not sure about any other original anchors. 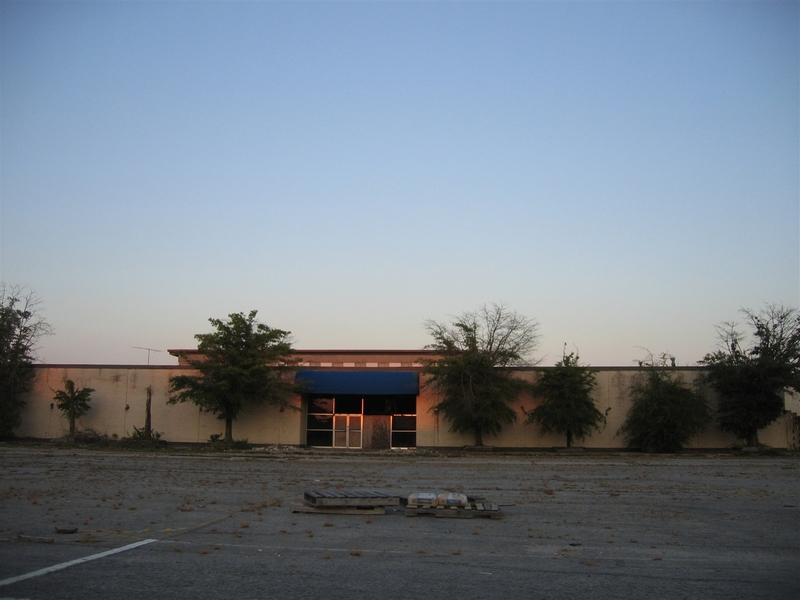 I do know that although Tarrytown was succesful, several of Rocky Mount’s bigger department store such as Belk and Sears stayed downtown and several smaller stores opted to operate dual stores in the mall and downtown. By the 1970s, Rose’s had come on board and JCPenney moved from downtown and opened in the mall around 1976 or 1977. Tarrytown also had smaller shops such as K&W Cafeteria, Kerr Drug, Baldwin’s, Buster Brown shoes, Serota’s (my sister brought her senior prom dress their in 1993), and more. Tarrytown thrived in Golden East Crossing Mall opened just about 3-5 miles down Hwy 301 North in August 1986 with 4 anchors and about 80 stores. Golden East took Belk and Sears from downtown and JCPenney and Roses from Tarrytown along with several other smaller stores. The mall got a renovation in 1989-1990 in order to keep up with Golden East. Goody’s opened in former Rose’s in 1992 and although they kept Montgomery Wards to the end, the mall was losing steam. 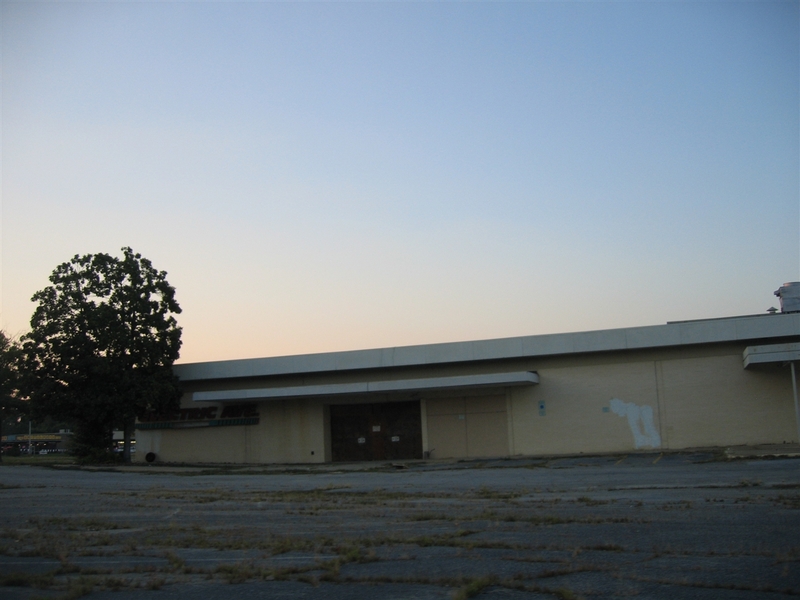 Rocky Mount Charter School opened in the former JCPenney in the summer of 1997. The mall dragged along until the flood in 1999. This is as much as I know about the mall. I personally think the mall would have closed anyways if it was still standing after Wards went under. It really funny because I was at the mall with my mother on the day of flood before the hurricane and the floodwater came that night and i never would have thought that the mall would be destoryed the next day. Most of my memories of the mall date from the Sixties. Every Christmas season, mall workers would erect a huge Christmas tree in the center of the mall near Roses. Bands and choirs would perform throughout the season. The stereos (big wooden consoles) in Montgomery Ward’s home electronics section would be blasting seasonal tunes. For some reason, Tijuana Brass and Willie Mitchell were always playing. When eight tracks came along, you could count on hearing them playing the sound track from “Butch Cassidy and the Sundance Kid”. I also seem to remember usually entering on the Montgomery Ward side and exiting down the other end through Kerr Drug….a natural progression I guess. Shopping indoors was a new thing for us. We were used to shopping downtown in stores like Whaley’s, Epstein’s, Belk Tyler and Sears. It was also fun to watch the trains. The “new” mall was handy and convienient though. I have a postcard somewhere of the interior of the mall facing Roses. Fun memories! I’m a native of Wilson, NC which is about 20 minutes south of Rocky Mount. We would always go shopping there for lack of a decent mall in Wilson. We frequented Golden East more often than Tarrytown Center. I do remember Montgomery Ward and Goody’s. I also remember a karate place and the K&W. The one thing that really sticks out in my mind are all the fountains, I guess I thought it was cool when I was younger. One of my mother’s childhood friends owned Serotta’s so whenever we went by we would usually stop in and say hello. I believe the last time I was actually in the mall was probably 1996, I may have gone into the Goody’s a few times after that. I was a senior in high school when the flood came through and I can remember watching the news and seeing a reporter standing on the overpass over 301 and not believing the amount of water I was seeing standing there engulfing the entire mall. It was a shame the way the mall just stood in disrepair for years and years. We would still frequent Golden East Crossing right up 301 and would always drive right past it. My impression was it was always going downhill. Serotta’s started in Kinston, NC where my mom is a native and had a store in Greenville, NC as well as Rocky Mount and Raleigh. Sometime in the mid 1970’s from what my mother told me they closed the Serotta’s in Greenville and Kinston and the family moved to Raleigh and continued to operate the store in Tarrytown Mall because I guess it still had high traffic. When Floyd hit they lost some merchandise but the family still has some stores in the Raleigh area. I live in Raleigh now and I go to the one in the North Hills shopping center and there is also one in Cary. The hurricane was probably the best thing to happen to Tarrytown Center. From what I remember of it, I’m pretty sure it would be closed by now if Floyd hadn’t come through. I remember them renovating the mall in the late 1970’s. That’s when they put the fountains in. The mall was somewhat of an upscale mall in its day. It had many independent upscale dressier shops which were Rosenbloom’s had 2 stores, Serottas, Cynthia’s, Coffmans, Levys, Bib n Tucker, Baldwins, and DA Kellys. There were a few others, but I can’t remember their names. It also had several Jewelry stores like Reeds and Zales. The mall also had a pet shop and a card shop. GNC had a health food store near Roses. There were several shoes stores which were Bob Howards, Sugarfoot, and Roscoe Griffins. Lerner came to the mall in the mid 1980’s. Record Bar and Music Land had stores. There was a Peanut Shack and a Ice cream shop in the mall too. There was also a store in the lines of Kirklands/Pier One and I think that store was Reflections. Merle Norman also had a store. At one time they were talking about adding on to the mall. This would have been in the 1970’s time frame, but that never came into play. I remember the big Chirstmas Tree in the center court at Christmas Time. They would always light the tree around Thanksgiving. People would come form all over to see the enormous tree. It looked like something you would see at Disney World or New York City. This mall was vibrant in its day, but when Golden East Crossing was built, many of the stores moved to that mall. Golden East Crossing was a double wammy, it had an impact on Tarrytown and Downtown. Belk and Sears left downtown and so did alot of the stores with them. Tarrytown tried to make a come back at one time in the late 1980’s, but it failed. When Hurrucane Floyd came through, that was the end of the mall. Actually the mall was about to close its doors. 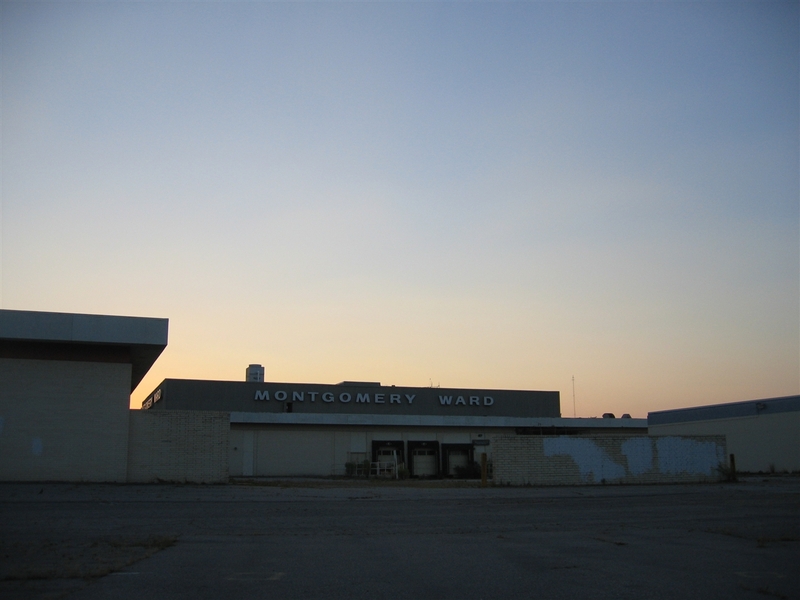 Not long after the mall was flooded, Montgomery Ward announced they would be closing all of their stores. If the mall had not been flooded, and Montgomery Ward would close their store, that would be the end of the mall anyway. It is nice to have the good memories of this mall though. I remember going there as a child especially, once I hit the teens years I think Golden East was in full swing and had taken all eyes off of the historic mall. I do remember having my ears pierced there at “The Earring Tree”, there once was a Hallmark store, an icecream shop, a hair salon, the NC tag office, an upscale ladies wear store, toy store, always Montgomery Ward – UH! – and I had my first job there at age 14 for about 2 weeks at the Tarrytown Grill (yum!). I remember visiting Goody’s more often than anything, which came later. There was an area inside I do have fond childhood memories… it was in the center and had a sky light, steps, and I think a little water fountain where we’d throw pennies and make a wish! I was in 5th grade when Tarrytown Mall opened in 1962. 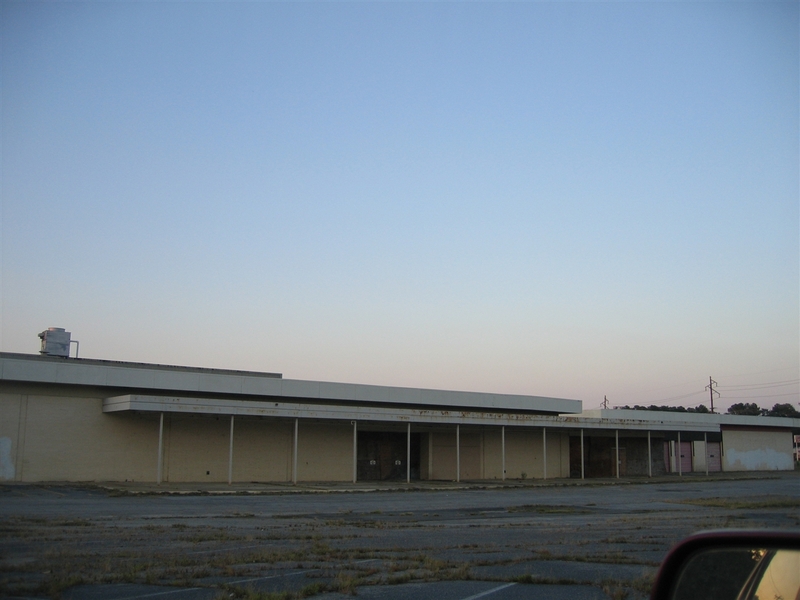 It really was the largest enclosed mall in eastern NC when it opened in 1962. North Hills Mall in Raleigh was still a strip mall at the time, and would only later become the larger mall when it re-opened ‘enclosed’ in 1967. Tarrytown had the ‘best’ shops (we would now call them boutiques) including Coffman-Wallace for guys (later had a nice ladies shop, too), Serottas for the gals, Howard’s shoes, Hertzberg Furs, special salons, jewelry shops, and others. There were the ‘large’ and ‘small’ chain stores like Montgomery-Wards, Roses, Kerr Drugs, Merle Norman, Hickory Farms (yes, a fixed storefront), etc. We even had a Record Bar in the later ‘60’s. This was ‘big’ for a small town. (Ralph K., didn’t you start here?). Restaurants came and went, but we’ll always remember Zolly’s (thank you Betty and Joe). Years later there was the Grill and others. The K&W always forgot it was a chain and treated everyone as a regular. Over the next 30 years, stores came and went and Tarrytown was important to Rocky Mount for many of those years. There was a large fire at Tarrytown in the summer of 1966 or 1967. I remember listening to the voice traffic on a ‘police’ scanner. It took the RMFD a number of hours to get the fire under control and out. Gossip around town had the mall obliterated (this was long before instant info via cyberspace), but fortunately most of the stores suffered only minor smoke and nuisance damage. It certainly made for some great buys for the ‘back-to-school’ wardrobe that filled my closet that year. Tarrytown was a hub of community activity for many years and this should not be forgotten. There was a sense of community there not found in today’s malls. This mall was host to craft fairs, antique shows, boat shows, talent events, awards ceremonies, job fairs, civic events and community fund raisers. From junior high on into adult life I can remember volunteering for civic-service events including health fairs and screenings, safety fairs, book collections, blood-mobiles, jail-a-thons, kettle bell ringing, etc. 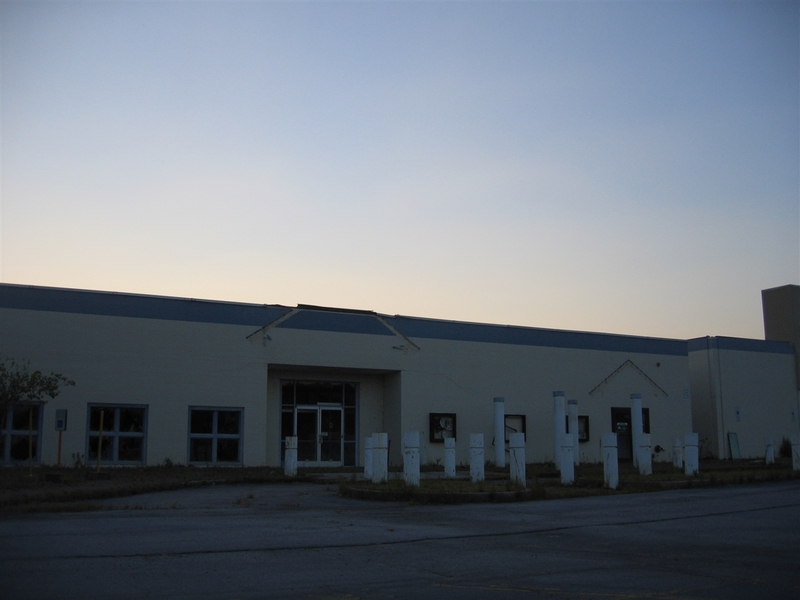 For a few years we were blessed to have a teen center located there headed by Gerald Niece. The huge Christmas tree most often was used to gather gifts for children who might not otherwise have any gifts. Local schools and churches showcased their youths’ talents ‘center stage’ opposite the tree. Tarrytown was the site for special events including high school proms, concerts, and other entertainment (Jerry Butler, Barbara Lewis, etc.). One highlight for me (besides my junior prom) was Charles Kuralt and Loonis McGlohon et. al. performing the narrative & song-filled “North Carolina Is My Home” center-stage at Tarrytown. So many years went by and Tarrytown was showing its wear and tear, not to mention store failures (MW, Kerr) and vacancies. It was sad to see. I had moved away from Rocky Mount by the time TS Floyd ravaged the mall in September 1999. During a visit just weeks before the storm, I visited the new Charter school located on the west side of the mall with a friend whose daughter attended there. It was encouraging to see an invigorating use for the failing commercial center. During my many visits after Floyd, it was saddening to see the rotting, neglected mall set there for years: the stilled clock, the leftover signage, the boarded up MW; the many questions about why it was left standing. We viewed Tarrytown during multiple visits every year from Dunkin’ early in the mornings – my brother’s favorite coffee haunt – it was disgusting on all levels – toxic, dangerous, ugly, and more. At least now there is new life coming to the site. I hope it does Rocky Mount proud. @Deb O Riggs, wow, I was sitting here trying to. Remember the name of Zollies, when the fire was, and some of the history and you ran through it and hit the nail on the head. I’m impressed, and thankful for the memories you stirred up. This mall was the only mall in Rocky Mount besides a small one downtown before Golden East Crossing. I remember the mall had a very upscale Hallmark store in 1985. When Golden East opened the JC Penny closed and Scotty’s Hardware moved in. The mall was the only place to be in Rocky Mount for a snack and retail therapy in the 80’s. I remember a Pepsi/Coke taste test challenge infront of the Rose’s. It was a small mall in comparison to malls in Charlotte or Raleigh but it was a very upscale mall in the 1980’s. Why Was A Hurricane Good For This Mall?.I Really Wanted To See This Mall From Inside & If It Was’nt For Stupid Floyd The Mall Would Still Be There.Could Any One Describe How Did It Look From Inside?.I Saw This Every Time I Went To Rocky Mount And My Parents Told Me It Was A Mall.I Went There 11 Years Ago And I Can’t Remember How It Looked. I can remember as a child going to Tarrytown with my mother and grandmother. For those whom still live here can you remember Mason’s Department store. (This was before Rose’s) They had a lunch bar in the back of the store and they had the best hot dogs and orangeade. I miss the people that worked there back in the early 70’s. It was the place to be!! I am also one of the many children that sang around those hugh Christmas trees every year!! Everyone talks about Golden East and how it was the down fall of Tarrytown. It may be true but Golden East will never replace the community feeling you found at Tarrytown during the holidays and all year long!! They had some big shoes to fill and they have fallen short!! I do shop there from time to time but it’s just not the same. It’s nice to meet freinds and shop but the workers act like they are doing you a favor by being there!! I miss good old customer service!! So long Tarrytown!! You were a grand lady in your day!! And we miss you!! I was born in 1952 and grew up less than one half mile from Tarrytown, just down Country Club road. We watched it being built.. I would ride my bike to the mall with friends around age 12 or so…original mall rats? We would hang out in the air conditoning. Our next door neighbor was a barber. He was an original mall tenant, with his shop near Roses. I believe that Roses was an original tenant also. I believe this as I won a model building contest that Roses was sponsoring when I was 12 or so. Also, my dog won a dog talent show when I was 13 or so, and the Evening Telegram ran a picture of me holding her. We saw the glow in the night sky from our front porch the evening that the mall burned. It burned the barber shop among other stores. Our neighbor reopened his shop on Sunset Blvd near the A&P store. Our first Rocky Mount home was totally destoryed by Hurricane Flloyd’s floods. It too is torn down. We would ride our bikes past WEED radio station to get to the mall. Occasionally we would stop in. The DJs were cool and we all got used 45’s from time to time from ther DJs. Englewood Market was across the steet. It was a source of baseball cards and candy. It was great living there. If you were at Tarrytown Mall in the 1990’s, then there wasn’t really too much to remember. I remember going there growing up in the 80’s and 90’s and I think it lost a lot of it’s character once they got rid of the water fountains. There were a lot and it seemed like they did fountains rather than plantars along the concourse. It’s funny, cause I remember thinking, as a kid, that every mall should have water fountains after numerous trips to Tarrytown. What else? I remember J. Royal. It was a clothing store, and I think it was somewhere near the center where the main traverse intersected another that lead away from Goody’s (Roses back in the day?). J. Royal had an old MG from the ’50’s in the front of the store. Apparently the battery was still connected because I hit the horn once when I was a kit and got an angry look from one of the employees. Let’s see, what else can I remember….In front of the Goody’s was a large stage like area that was lower than the floor itself. It think it was surrounded by waterfountains and had green carpet. To the left of the stage was a grill which became Monk’s Grill (then Andy’s) and right beside it was a toy store (I think KayBee). I also remember what Philip mentioned about the high ceilings with wiindows at the top. What else? The MW was on the left side of the mall, and there was another anchor on the right. I don’t remember what I was, but I think I was some sort of CJ Woodmasters type of store. Also the K&W Cafeteria was right at the front. Oh, and the Kerr Drugs also had very retro looking green carpet in it too. Hopefully this description was somewhat helpful. If you have ever been in an older mall from the 60’s-70’s, a lot of the styling was the same prior to Tarrytown’s remodeling in the ’90’s. Sad to see it destroyed by Floyd. I was actually in this mall the day before the flood came in and wrecked it for good and all. Most every time I visited the place near the end it was more or less deserted and was in a general run-down sort of state, and I concur with posters above who said that when Wards closed down, the mall would have been over as a going concern, as really they, Goody’s and the K & W (which moved to a freestanding location on the north side of town) were all that kept the lights on at the mall. Golden East Crossing up the road really took the wind out of Tarrrytown’s sails and it never really recovered. For most of the 1990s it was a lot of local stores, a few hangers-on that hadn’t moved to be tenants or closer to Golden East, and a kind of continuing flea-market/dirt mall thing that had set up at the former Kerr Drugs location. While it may have spent the 1990s on life support, I can vividly recall visiting it in the 80’s in my infrequent trips to Rocky Mount and it was quite a sight, especially around Christmas. It’s a shame it was not long for the world even before the flood came, but Rocky Mount lost a lot of things to Hurricane Floyd. While I do miss it, it’s great that the land could be re-used as Rocky Mount has a lot of vacant retail that sits around unused. I have many fond memories of Tarrytown mall as I lived very close by and use to walk/ride my bike there all the time. My grandmother said it was a pastureland originally. I remember the record bar, Kerr Drug with the lunch counter, JPC and Mongomery Wards, Mr Dunderbaks, Roses (and its lunch counter), photo fast, kbtoys (where I went a lot), the tiny cobbler shop and the cafeteria. I worked at Nickelodeon, the game room on the outside of the mall in 1986. There used to be a flat common area in front of Rose’s, but they installed a small amphitheatre there with foundtains and hung pastel drapes later. Anyone remember the funny mural of cartoon people that was painted near the ceiling above serotta’s? My grandmother also worked at Bib and Tucker and pickwicks which was a card shop. When the ‘new mall’ opened up, TT mall kept going for a while, but when nichols closed, there was not much left other that montgomery wards and goodys. I guess the end was when it was just a flea market mall and a school and the DMV office. 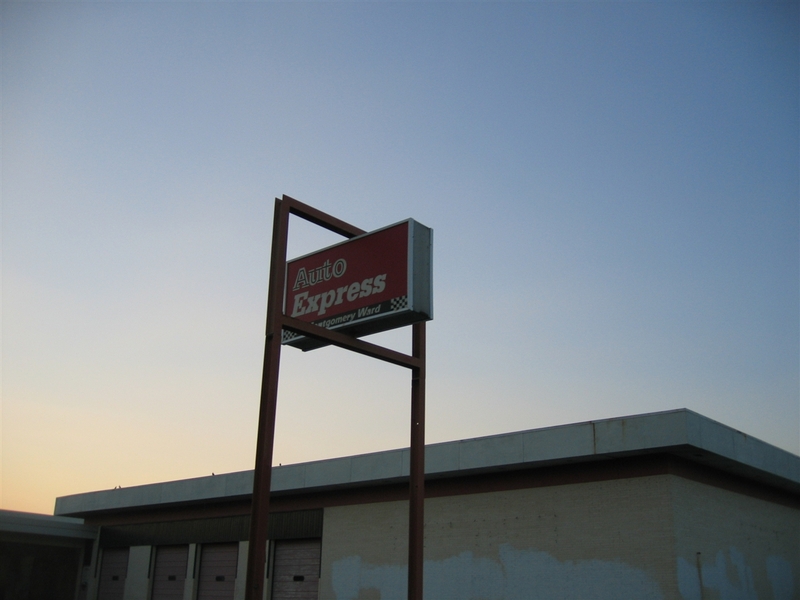 Thankfully I did get some pics just before it was torn down and even got a TT mall parking sign. I’ll always remember it as a busy and enjoyable place to go. I lived in Rocky Mount in the mid- to late 1970s, and remember Tarrytown as THE place to go shopping. Montgomery Ward, Kerr Drug, and the fountains/greenery inside the mall are vivid memories. I bought records at Record Bar and got my annual pair of tennis shoes every spring at Roscoe Griffin. But perhaps my favorite store was a Western shop that sold boots, hats, and belts. I got a pair of boots there one birthday, and spent a fair part of my allowance on the horse breed stickers that I’d paste onto the lunch box I’d take to Benvenue Elementary (located approximately where Golden East is now). I haven’t been back to Rocky Mount for about 25 years. While I know nothing stays the same, I’m sorry to hear that Tarrytown is no more. Thanks for the pictures and the memories, everyone. I also remember a stand in the middle of the mall where you could buy leather things and they would burn in words or names you wanted into them. My friend Ray Matthews worked at that stand. Does anyone remember Mr.Leonard Rawls or the Bib and tucker? @Joseph Williams, I remember the Leonard Rawls that worked for Hardee’s Corporation back in the day. I remember the sore bib n tucker but little about it. I remember going there as a kid to the M. Ward and the little Pizza parlor there. I loved playing the PacMan arcade! That mall did take a huge hit in the mid 90’s and shop after shop closed down. There was always some kind of event happening in the center of the mall. Wow, I’m just now reading this. I had no idea Tarrytown was gone. I left Rocky Mount in 1979. It used to be one of the few places for teenagers to hang out at, other than the Reservoir and McDonald’s. I remember Merle Norman Cosmetics there and a bookstore. @Scream, I also left rocky mount around 79 but parents lived off sunset close to tarrytown so I went back some. Their house also flooded when the mall did, the flood and hurricane did a huge amount of damage to rocky mount. I do not go back now , the crime,gangs,are so bad, now that my parents have passed I just choose to stay away. Now everyone just goes to golden east for shooting practise. City on the rise must have been a reference to the drug use. I remember visiting Mason’s as a very young child in the early 1970’s. It was what back then would be referred to as a “dime” store – similar to Woolworth’s in size and selection of merchandise. Not sure what happened to the Mason’s chain, but apparently at least this location later became Roses. @Rocky Mount Remembered, I remember Mason’s too. I remember it was where JC Penney’s was and that Rose’s was Rose’s until Big Lots moved in and out, then Goody’s moved in. We lived about half way between Raleigh and RM and with my mom being from Tarboro would got shopping in RM as much as Raleigh. I remember most of the places mentioned by the others. I remember the fountains and especially the Xmas tree because it was the largest tree ever. i left for college in the mid ’80’s and by the time i returned Golden East was open. I watched the mall decline over it’s remaining years, the flea market stores, M-W, the Charter School in the last years. Just hate the way it ended, it was a great place in ithe 70’s and early 80’s. BTW the sports store that opened at some point in was named after Jim Clack (RM native that played football at WF and was a Guard for two of the 70’s Steeler teams before being traded to the Giants) and it was across from the B.Dalton bookstore. Golden East hurt this mall much like the current economy has hurt them. The way things look, we’ll be taking about Golden East here too. I think the sports store you are referring to was Winners Circle. As I recall, Clack’s place was over at the Westridge shopping area….in front of the train. I am not sure what was before the Winners Circle. There was another sports store on the other side of the mall….it became Spooners at sometime. I am unsure of the name before that. I’ve lived in the RTP area of NC all my life, and I remember Tarrytown Mall in Rocky Mount from a couple of periods. 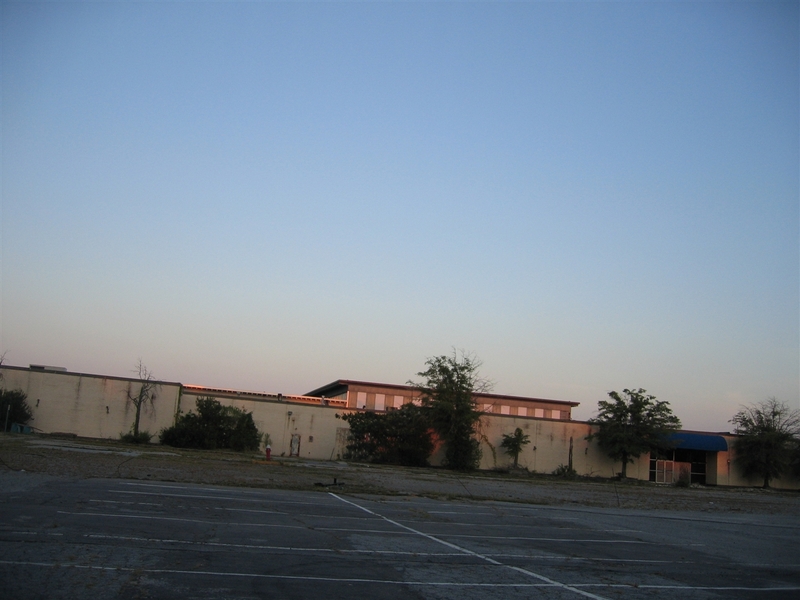 In the mid-70s, before the construction of South Square Mall in Durham (another defunct mall now demolished), Tarrytown was the closest mall to Raleigh that had a Montgomery Wards. They also had a JC Penneys, and perhaps a Roses store. Roses was (is) a regional chain of discount department stores based originally in Henderson NC. They went into bankruptcy in the mid to late 90s, but seem to have emerged intact & are on the comeback. By the time Hurricane Floyd struck in 1999, I’m pretty sure all of Tarrytown’s anchor tenants had closed up. JC Penney had moved to Golden East Mall, Roses had closed most of their stores & hadn’t started on their comeback yet, and Montgomery Ward was bankrupt. In 1989, I was working at a store in this mall, I won’t say which one, but it is an international chain, I remember being told to close up as early as 4 hours before the official mall closing time ( 9 o’clock), due to NO BUSINESS. Opening at 10am and closing between 6pm and 7pm, some days my store only made $30-$40. It was that bad. would it be possible for me to use one of these photographs for an album cover? thanks.